Sofie holiday home is a great spot for nature lovers. This spacious mansion lies on the southern slope in the village of Zlata Olesnice and offers you an undisturbed view with the sun on your terrace until late in the evening. You have a covered terrace on the large grounds, a swimming pool, and there is enough room to for the children or the dog to play. Sofie holiday home has an atmospheric and neat interior. 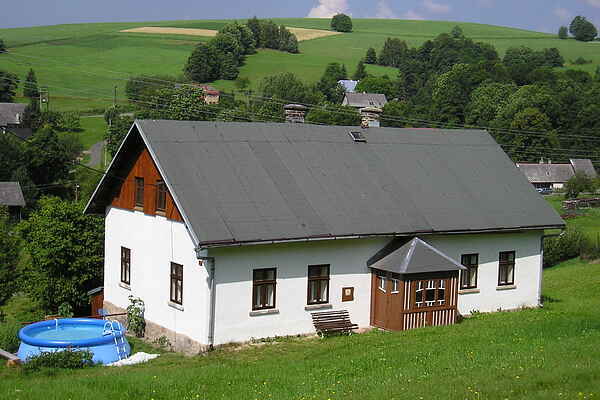 You would be residing at the edge of the Krkonoše Mountains, 6 km from the city of Vysoke nad Jizerou. Hikers and people who like tranquillity are in the right place here. Take your dog, then you can already start walking from your holiday home. Each room in the house has to be heated separately by an open fireplace (charcoal or wood is available).